This could be classified as a rumour, but Samsung has made it pretty clear what's coming. With the ever growing popularity of the phablet phones lately, this is great timing for Samsung to release their latest Note III Device. 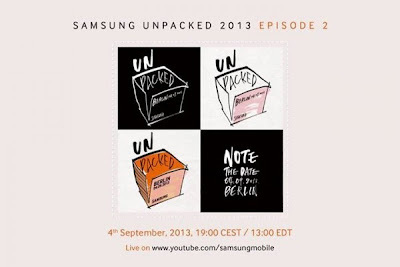 reports around the internet indicate the Samsung Galaxy Note 3 will come with a 5.7-inch 1080p display, quad-core Snapdragon 800/ Exynos 5 Octa processor, 3GB of RAM, 13MP rear camera, 2MP front camera, LTE Advanced connectivity, Android 4.3 and S-Pen support. of course Sony's Z Ultra to compete with as well. Samsung with their large following will no doubt have an upper edge on sales when the Note III comes out over the competition. I'm personally holding out for HTC's front speakers, I'd happily give up the S-Pen for those big beautiful twins.